Easy difficulty. 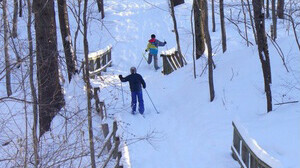 Woods trails above the zoo area double as ski trails. Loop back down and visit the zoo afterwards. Trails also go past Glen Loch Lake. Trails can also be accessed from small parking lot on Cty Rd S or on the parking lot above the zoo off Erma-Tinger Drive.